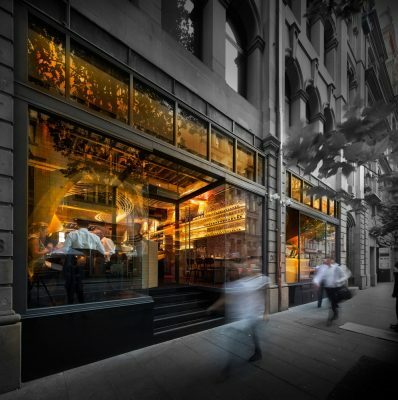 Enter Projects has recently been commission by Primo for Lot 1 Café & Restaurant, located at 20 York Street, Sydney CBD in the ground floor and basement of the 950sqm John Solomon building. 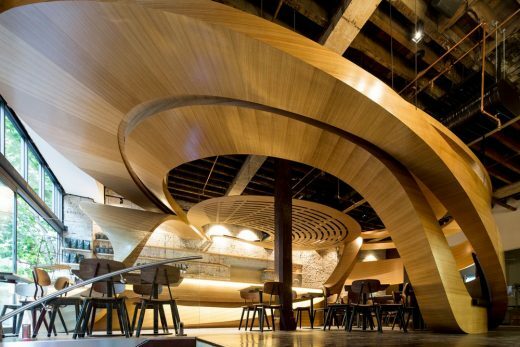 Being in the coffee industry for 3 generations, the client enthusiastically embraced the design concepts, using patterns that delicately lace the infamous ‘Café latte’ as the primary design inspiration. Lot 1 at 20 York St is a conversion project from an original storage house & cart-way, to a retail store, to Lot 1. 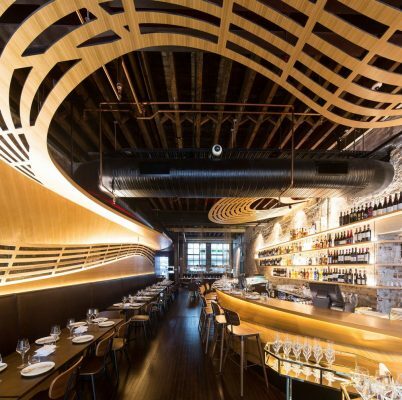 The design explores complex geometry and the connection of form and functionality utilising digitally fabricated interiors. 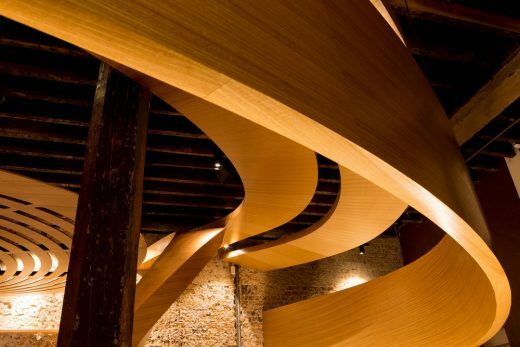 Curved timber geometries using native Australian materials join seamlessly to circulate, unfold and connect all of the functions of the venue while providing a journey through the historic Sydney interior. 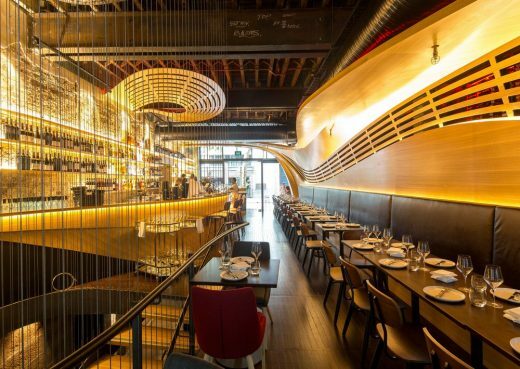 Spaces were stripped back to reveal the existing fabric of the building; principally exposed brick, sandstone walls, wooden columns and old steel work, all serving the building during it’s many stages and all integral to the rich, original tapestry. 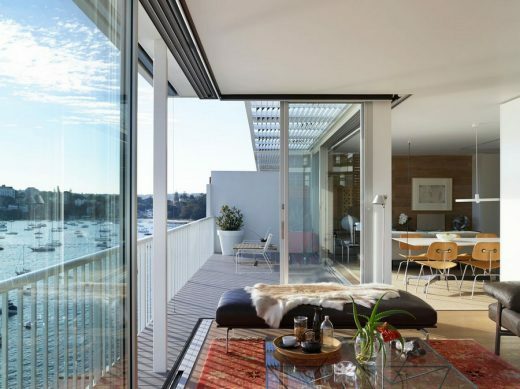 The existing features are intelligently juxtaposed by the continuity of the new form and the smooth Australian hardwood veneers are further layered by an adaptable lighting scheme. Careful spatial planning has maximised foot traffic within the interlinking coffee shop and restaurant. The downstairs offers private lounges and dinner booths with the basement mezzanine giving an option of alfresco dining. Dynamic geometries interlace the many spaces with 3 dimensional curves ensuring that the project cannot be comprehended from one single vantage point. From conception, to early renderings and 3D models, through to laser cutting and CNC, only 3D models were used without construction drawings or conventional plans and sections. 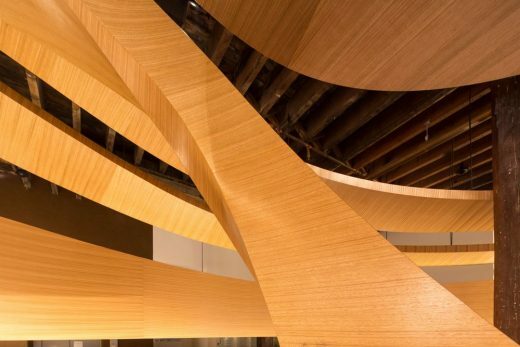 The result embodies conceptual swirls that motion a dialogue between the building, the brand and the user. 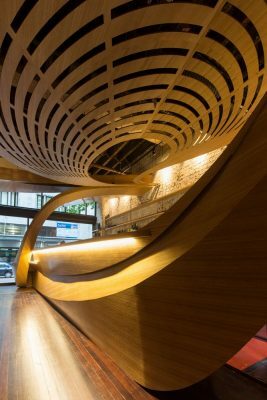 Excellence in the design lies in how Enter Projects artistically interpreted the everyday, familiar coffee swirl pattern and transformed that into a fully functioning 600 seater café, bar and restaurant. 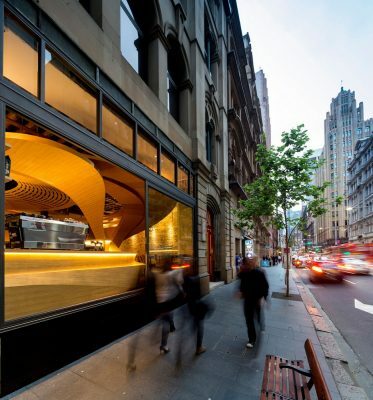 The space now serves not only as a hallmark for the coffee company themselves but also as a destination for the many end consumers in Sydney’s CBD. The design solution is an example of excellence in Interiors given the unusual marriage of awe-inspiring aesthetics and full functionality within one given space: using non-orthogonal geometry, it delivers a form that remains responsive to its function and surroundings. 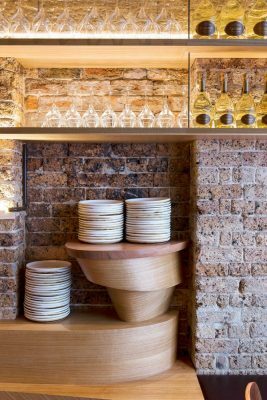 Rigorous space planning was required both front and back of house alongside a well defined but subtle colour palette which created a comfortable and atmospheric environment. The gymnastics of the geometry were required to perform multiple functions including service, seating, privacy and lighting.